Dan Linfoot finished ninth in the appalling wet conditions of the Donington GP250 race in his debut on the Team Sicilia Aprilia. It was the 18-year-old’s first race of the season and his only previous track time this year had been testing in Spain on a 125 and a brief run out on an old TZ250 Yamaha at Mallory several weeks ago. He gave MCN his view of the weekend. MCN: Great result first time on the bike. How do you feel? Linfoot: I’ve got a distinct feeling of déjà vu right now. I was ninth in the 125 Grand Prix here two years ago in identical conditions. It was a war of attrition out there today. Every lap I had a big moment but I just kept composing myself each time. MCN: The weekend started with bad weather and ended with it as far as track time for the 250s. What was it like Friday to rock up for your first race of the season and be at the British GP? Linfoot: The first time I sat on the bike was here for practice. I didn’t fall down like so many did on the first day in the appalling wet conditions so that was good. Riding it didn’t faze me at in the wet, even though the engine power delivery is all or nothing. In some ways it was better to learn the throttle control I need for this bike. MCN: So what spec is the bike? 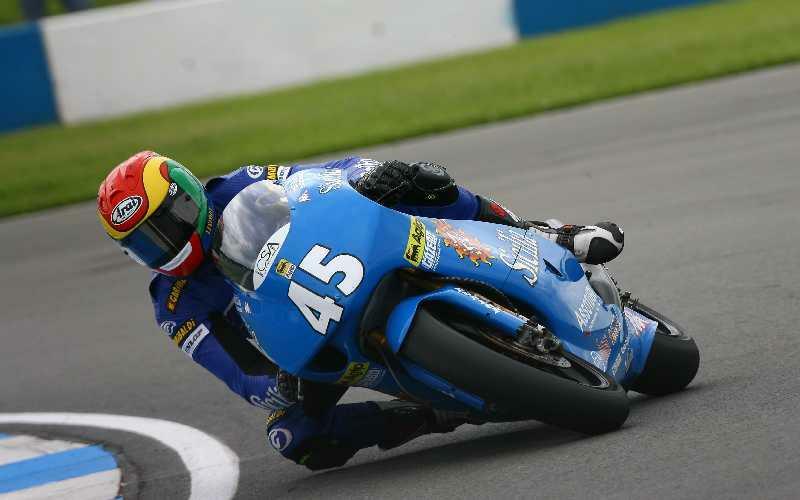 Linfoot: It’s an ex-Anthony West 2006 factory v-twin Aprilia. The bike is fast though it’s got a very fierce power delivery. MCN: It turned dry for qualifying on Saturday and you wound up on the penultimate row of the grid, three seconds off pole. How did you feel about that? Linfoot: I wasn’t at all despondent, though I was hoping for better. I did the same lap time that I did last year even though Saturday was first time ridden it in the dry. The team said that initially they gave me an ignition map that made the bike relatively easy to ride but on Saturday they tried a different map – with a different ignition curve. Linfot: It gave it more bottom end and was even fiercer off the corners. The team said they wanted me to really whack the throttle open on the exits but it wasn’t really what I was ready to do. I was feeding the power. MCN: What’s the chassis like? Linfoot: Left to right in the slow stuff it’s good. Under braking it stands on its nose where the wheelbase is short. I need time to adapt to that. In the final sector on Saturday (the Esses, the Loop and Goddard) I was losing 0.6s to Laverty! MCN: After the luxury of some dry time on the bike it was back to rain for the race. How was the start? Linfoot: The team told me how to get the bike off the line well and it worked to perfection. I used my normal braking point (from Saturday’s dry session) and I was still tucked in as the pack around me sat up braking. I found a way through them, then I picked off three riders going down Craner. MCN: You seemed to get into a scrap with Karel Abraham? Linfoot: I was dicing with him until he pushed me wide and Eugene came by me. But he lost the front right in front of me at the Old Hairpin. That was the slippiest place on the track. I was getting two-wheel slides there every lap. Linfoot: It did a bit. He was places on the track I wanted to be and I’m sure I was where he wanted to be. I let him go in the end but then all I got was a faceful of spray. MCN: So how would you sum up your first race back? Linfoot: I’m really happy with this. It’s something to build on for the rest of the season. I’ve not raced all year so I can’t be too unhappy.